Preheat oven to 350 degrees F. Coat 12 muffin cups with nonstick spray. In a large bowl, combine sausage, potatoes, cheese, red pepper, green onion, chopped oregano, salt, and black pepper. Divide mixture among the prepared muffin cups. In a medium bowl, whisk together eggs and milk to combine. 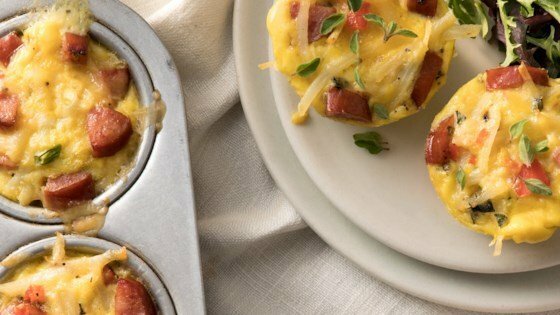 Slowly pour egg mixture over sausage mixture in the muffin cups. Cups will be full. Bake in preheated oven for 20 to 25 minutes or until puffed and set. Remove and let cool in cups on a wire rack for 10 minutes. Loosen sides and remove from cups. Serve warm, garnished with additional oregano, if desired.